Welcome to our website concerning the life, interests and accomplishments of an Episcopal Priest, Psychic Researcher, Magician, Magic Historian, Lecturer and Author. For over forty years Canon William Rauscher's unique ministry embraced the traditional and the more interpretative and strange areas of mystery. In the midst of an active and creative parochial situation he attempted to explore the mystical and psychical dimensions of religion. His unusual experiences, always tempered by his Christian foundations and beliefs, have provided an array of unique and sometimes intriguing friends and acquaintances. The Menu to the left is your key to finding anything on the website. Clicking on "Home" will display an index of every page on the website! As far back as 1960 Rauscher had presented science and religion seminars and sponsored countless speakers in the area of consciousness studies. He believed, even then, that the future would bring these two fields closer together. His former church rectories have hosted many personalities in a long list of lectures, discussions and remarkable guests. The noted researcher Dr. Ian Stevenson once conducted interviews. The controversial and enigmatic Arthur Ford demonstrated his trance mediumship for guests. Douglas Johnson the British psychic turned into Chiang, his spirit control. Ted Serios strained at a camera to attempt thought pictures. A medium called forth 'supposed' past lives. A famous magician talked of illusion, sleight of hand and fraud. Lamar Keene, the self confessed fake medium revealed his secrets at the rectory. Hypnotists tried to create X Ray vision. Scientists spoke of parapsychology and religion. Clergy told of their psychic and mystical experiences. People claiming to be possessed have paced the study of Canon Rauscher. Astrologers have drawn charts over dinner. A prominent psychiatrist privately read tarot cards for the parish staff. Automatic writers brought their manuscripts to be read. A relative who read tea leaves and cards gave a special 'session' for the Bishop's wife. Secret visits have been made by prominent persons such as the late governor of Iowa, Harold Hughes and wished their interests at the time to remain unknown. From the earliest of mystical and psychical experiences in history to the 'Psychic Revolution, 'Aquarian Age' movement and 'New Age' mentality, Canon Rauscher has juggled a procession of intriguing personalities. Flying saucer fans have brought their photos of UFO's. Young adults have begged help for others involved in Satan worship. Newscasters have privately pursued their interests in Canon Rauscher's research library. Students came to borrow books and prepare papers. Telephone calls ranged from those seeking help under 'psychic attack' to those thinking they were destined to be the successors of some famous psychic or where convinced they lived in a haunted house. Interviews were conducted by magazines, newspapers and T.V. Newscasters. College professors came to Christ Church to research papers while discussions were held with such notables as Edgar Mitchell, sixth man to walk on the moon. Thoughts shared by so many were the result of interest in what was then called the Psychic Revolution and the calling within to seek and find. They came to look for direction and share their own search. Some were often lost, misguided, stumbling and falling at the risk of their inner life. Canon Rauscher considers those years as a special extension of his ministry. They were also part of the fabric of a personal study of consciousness on many levels. He is convinced that the twists and turns of a spiritual search require careful guidance. He is also convinced that a firm foundation in the teachings of Christ is an anchor that cannot be dismissed without possible negative consequences. Without some firm commitment to the highest principles as presented in the life of Christ and the practice of sensible spiritual disciplines there is great danger for the soul. From the earliest of mystical and psychical experiences in history to the 'Psychic Revolution', 'Aquarian Age' movement and 'New Age' mentality, Canon Rauscher has juggled a procession of intriguing personalities. 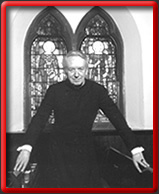 His final thirty-six years of ministry in the parish of Christ Church, Woodbury, New Jersey, also consisted of the entire pastoral, management and worship planning that any active large church demands. He sees his life as an unusual composite of both the traditional and inquisitive aspect of mind and spirit that always had as its focus a dedicated Christian devotional life. In his vast potpourri of experience he reflects upon it as a walk along the street of mystery and meaning.